Narooma (the official spelling was ‘Noorooma’ until 1972) is a popular seaside fishing resort with a population of 3443 which is located at the mouth of the Wagonga Inlet 348 km south of Sydney via the Princes Highway. Thought to have been occupied by the Wandandian Aborigines before white settlement, the area became a cattle run in the 1840s. The ‘Noorooma’ run covered the area from Wagonga to Bermagui. Francis Hunt was probably the first European settler. After the 1861 Land Act opened the area to selectors the run was reduced in size. Gold was discovered in the area in 1880 at the Montreal site and finds soon followed at Cape Dromedary, Mt Dromedary, Wallaga Lake, Wagonga Heads, Corunna and Kianga. A post office called ‘Noorooma’ was established in 1880 at the site of present-day Corunna but changed its name to Corunna two years later. In 1883 a township was surveyed and Narooma was declared a port the following year. Development was slow. Timber rose in importance around this time and a sawmill opened at South Head Wagonga, soon followed by a hotel, store and wharf and a few cottages and, in 1888, a school. A new Narooma post office was opened in 1889. As a sign of the town’s growing importance the court moved from Eurobodalla to Narooma in 1895. In 1906 the Mitchell Bros moved their sawmill operation from Port Stephens to Narooma. Railway sleepers were soon being cut from the timber in the Wagonga forests and the timber industry remains an important part of the local economy. Shipbuilding and oyster farming were also established early in the century and the latter too has retained its local importance. With passengers arriving on the steamship service of the south coast many began to explore the fishing in the area as a form of recreation and tourism became a feature of the local economy as the town established a reputation as a holiday resort for boating, aquatic sports and big-game fishing: a reputation it has retained to this day. Commercial fishing commenced in the 1930s and a fish cannery opened on the banks of the Wagonga River in 1940. A bridge was first built across the river in 1931. Of some architectural interest in the town are the Uniting Church (formerly Methodist Church – 1914) and parsonage (1935), located at the top of the main street (Wagonga St) on the right-hand side if you are heading south, past Canty St. These two structures, conventional of design, have a simple strength and dignity. They are considered amongst the finest Australian timber churches of the early twentieth century. The decorative gable truss structures at the end of the nave and the small porch are of note. The gothic revival bell tower was erected in 1934. The parsonage, with its charming picket fence is of an unusual design which complements the main structure without dominating it. There is a huge bay window at the front with lead-light windows, sunburst timber decoration on the central gable and a fanlight over the door. Montague Island is a wildlife and marine-life sanctuary and flora reserve 10 km offshore just south of Narooma. This 1.4-km island (its maximum width is 800 m) was named after the British statesman, George Montagu Dunk, by Captain Cook when he sighted it from the Endeavour in 1770. The Aborigines of the Wallaga and Djiringanj tribes who frequented it in search of food (birds, eggs, penguins and seals) called it ‘Barunguba’. The island was once a promontory of the mainland but was separated during the last ice age. The waters teem with fish because they are in the east coast current and are channeled through a narrow section of the Continental Shelf. It is the only remaining site in New South Wales on which Australian fur seals are known. There are thousands of fairy penguins, plus shearwaters, hawks, silver gulls, sea eagles, harriers, crested terns and peregrine falcons. The National Parks and Wildlife Service have established a base on the island and are currently attempting to restore the vegetation to its native state – a closed ecosystem of remnant coastal vegetation – as a succession of European animals and lighthouse keepers have disrupted the flora with introduced weeds. Goats and rabbits were transported to the island to supply meat for shipwrecked sailors. The lighthouse has been operating since 1881. It was built from the granite which forms massive outcrops and rounded boulders on the island and which was once quarried and used in the construction of Sydney buildings such as the GPO in Martin Place. There were originally three lighthouse-keepers and their families on the island and their attractive houses remain, one of which is being restored to its original state and there are plans to turn it into a museum. The light, originally kerosene-powered, was converted to electricity in 1969 and then to automatic solar power in 1986, eliminating the need for the keepers. Access to the island is only possible through organised charter-boat tours from Narooma which can be arranged through the Narooma Visitors Information Office (02 4476 2881). 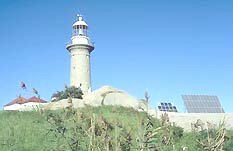 NPWS staff conduct guided tours of the lighthouse buildings and environs and tell tales of the island’s past. The cost is currently $60, ten of which goes to the NPWS for maintenance costs. For more information on the site phone the NPWS district office at Narooma (02 4476 2888). The trip to the island incorporates whale-watching from mid-September to mid-November. 12 km south of Narooma is Tilba Valley Wines and Vineyard (02 4473 7308). Take the signposted turn to the right off the highway. A family business it was the first winery on the south coast. They offer a lunch each day and are open 10 to 5 weekdays and 11 to 5 on Sundays. Continue along the gravel road and follow the deer signs for another 7 km to Brooklands Deer Farm (02 4473 7330), an unusual sanctuary with a rustic feel located at a scenic site. The farm possesses picnic and barbecue facilities and the barn is the venue for barn dances throughout the year. The opening hours are 10 to 5 seven days a week. 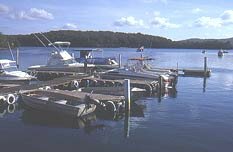 Boating, waterskiing and fishing can be pursued in the wide, open waters of Corunna Lake to the south and Wagonga Inlet. 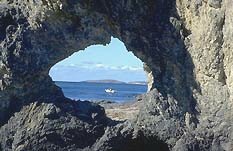 The former, with its coloured sands and strange rock formations, is popular with rock collectors while the latter is rich in bream which congregate around the oyster leases. The headlands, beaches and lakes south of Narooma are also fine spots for fishing, and prawning can also be pursued in season at some of the lakes of The Dromedary Conservation Area. Tilba Tilba Lake is a good Beach fishing can be enjoyed at Brou Beach and rock fishing off Dalmeny to the north, where there is also a boat-launching ramp. Contact the Narooma Visitors Information Service on the Princes Highway (200 metres past the bridge on your left if you are coming from the north) to organise tours, cruises on Wagonga Inlet, boat-hire or to obtain the names of local service providers. The trip north across the bridge, east out to the coast, north to Dalmeny and back to the highway is pleasant. The more adventurous may wish to head north from here and turn west off the highway on to Mitchells Ridge Road (unsealed) just north of Lawlers Creek. After about 4 km another road heads off to the south back across Lawlers Creek and will take you past Kianga Road on your left, to Grants Lookout. From here the road continues south across Bilba Bilba Creek to Burrimbidgee Creek at the western end of the Wagonga Inlet, where there is a picnic spot. From here it continues south for a while then loops back in to the highway just south of Narooma (approx. 35 km). Both are signposted tourist drives. Some fine local lookouts include Harold Buckeridge Lookout off Kianga Rd at Makins Hill, Wagonga Head Lookout on Bar Rock Road at Wagonga Head near the mouth of the river, where you can examine Australia Rock (which features a naturally-occurring hole with an uncanny resemblance to the map of Australia), the lookout off Ballingalla St near Narooma Beach and the golf course, and another further south along the beach, past the cemetery, at the end of Glasshouse Rocks Road where Montague Island can be seen in the distance. Surfing beaches abound though Bar Beach which runs north from the river mouth on the northern side of the river has a very good reputation. It also has an enclosed swimming area for children. The beaches to the south in the Conservation Area are especially good. The golf course in Ballingalla St is scenically situated atop a cliff. Take the first left after the bridge if coming from the north, into Fuller Parade. This route takes you past the swimming pool and jetty, bends to the left becoming Noorooma Crescent, to the right becoming Pilot St, then takes a sharp right to become Ballingalla. The golf club is to your left as you turn the last corner. Policing requirements of Narooma are as diverse as the range of activities on offer to residents and tourists alike. Due to the fact that Narooma is situated on the coast and surrounded by National Parks it is necessary for local police to be multi-skilled in a variety of areas such as sea rescues, proficient in the area of forest/mountain searches, as well as being able to handle a multitude of tasks simultaneously, particularly during the extremely busy holiday periods. The fact that Narooma is situated on the Princes Highway, serious motor vehicle accidents are part and parcel of every day activities of the local Narooma police officer and such each officer commences duty not knowing what the shift will produce or where that may be required to police. As a result of the recent restructure of the NSW Police Service, Narooma have taken on the additional responsibility of the Bermagui and Cobargo areas during the period that these areas are not staffed by the local police. At the present time there are a total of 10 police officers appointed to this area. This comprises seven police attached to Narooma, two at Bermagui and a single officer at Cobargo. Narooma are fortunate to have the use of a general support officer (public servant) to assist with the increased paper work associated with a larger policing area. As a result of Narooma’s somewhat isolated location from Batemans Bay and Bega Police Stations, the NSW Police Service has realized its uniqueness by providing a number of resources not normally seen in police stations of its size. Narooma have two police vehicles, a 4WD and a marked sedan available for use for personnel from within its team as well as a fully functional accredited sea rescue vessel which can put to sea at very short notice. Narooma has a population of around 5000 people, however during the holiday periods, particularly around Christmas the population swells to almost triple this number. To provide a better service to the community, Narooma Police with assistance from Bermagui and Cobargo provide a 24 hour policing service during the Christmas/New Year period which effectively means that police from this area can respond to your needs on a much quicker basis. 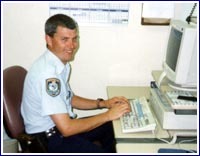 Snr Const Peter Vaughan at work on the station computer.